We throw away a mind-boggling 25 percent more trash from Thanksgiving to New Year's than any other time of the year, sending an extra 7 million pounds of garbage into our landfills. By using recycled or recyclable gift wrap, you'll send waste into our landfills this holiday season. I know, that's not a very merry statistic. But it is one we can do something about this holiday season, without crimping our festive style too much. By simply using eco friendly gift wrap and choosing sustainable gifts, we'll be sending a lot less waste into our landfills. I doubt I'm the only person who's felt more than a tad Grinch-like come Christmas morning when my garbage cans are at their festive best, filled with shiny, multicolored wrap I can't dispose of in the fireplace safely, so off they go to our landfills. Green is the color of the season, and it makes us all feel better making smart choices. And we really do have environmentally friendly options that will reduce the amount of solid waste we generate over the holidays. 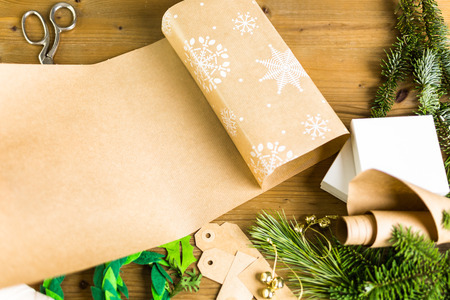 Here are some eco friendly gift wrap ideas to consider this holiday season. Wrap gifts in recycled packaging or recyclable materials already in our homes, such as colorful pages torn from magazines, old posters, colorful shopping bags, old maps, the Sunday newspaper comics, cloth napkins, or scarves. Use all that extra artwork the kids bring home from school as wrapping paper for presents to proud grandparents, aunts, and uncles. Avoid wrapping paper entirely by arranging your gifts in reusable decorative tins, baskets, or boxes. Make the wrap part of the gift. Give a chef kitchen utensils wrapped in a festive dish towel and tied with a cloth ribbon (so it can be reused); give a gardener a watering can with tools tucked inside. If you do buy wrapping paper, look for rolls created from recycled paper. Unwrap gifts carefully, and save the wrapping paper and plastic bows for reuse next year. Wrapping paper and bows are often one offs - used once and thrown away. Did you know that if every family reused just two feet of holiday ribbon, the 38,000 miles of ribbon saved could tie a bow around the entire planet? Kids get a kick out of opening individually wrapped presents, but for an adult's gifts you can keep packaging to a minimum by wrapping them all in a single reusable box or by using last year's left over wrapping and bows. If you send greeting cards, choose recyclable ones or postcards. Or, buy from local organizations that benefit good causes. Save the cards you receive to cut up and reuse them next year as gift tags. They're also a good resource for kiddie art projects.